Just a quick email to let you know how much my children are enjoying the grammar course. They are learning heaps and are so enjoying designing their posters. We have them pegged up where they can see them and review. Thanks so much for putting this together. I am also really enjoying teaching this and find it a great activity for Mondays. I usually find Mondays a bit of a challenge after busy weekends – so I find it great to have this already put together and ready to go. So, many thanks from the Barlow Family. Alongside this I am using a FANTASTIC book which goes beautifully with this study. 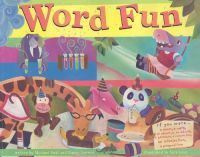 It is called Word Fun written by Michael Dahl and Nancy Loewen. … It covers heaps of the same topics you have covered and it is written in such a fun and appealing way for children. It also has some really cool little activities at the end of each topic. For example today we read about adjectives and the activity was for the children to write an acrostic poem of their name just using adjectives. They really enjoyed this. It is a brilliant book which I highly recommend.